Veteran team hopes for success in Cape and Islands league. MV's Addy Hayman goes on the attack against Bishop Feehan's Laurel Bellemore during a match last spring. 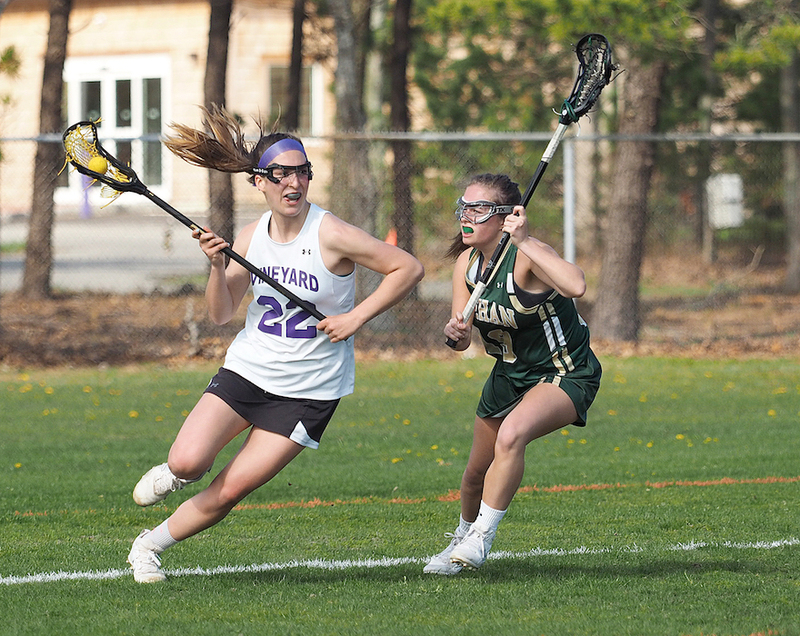 The 2019 edition of the Martha’s Vineyard Regional High School girls lacrosse team returns a core of high-achieving athletes amid high expectations for a debut in a new league this spring. The Vineyarders return eight seniors and four juniors to a squad that went 14-6 last year. The team lost two seniors, Lily Piggot and Audrey McCarron, to graduation. The 2018 squad advanced to the quarterfinals of the South Sectional state tourney before bowing 18-3 to Cohasset, which won the Division 2 state championship for the second consecutive year in 2018. MVRHS will compete in the refurbished Cape and Islands League, moving from the Eastern Athletic Conference (EAC). “It’ll be a new experience, and our kids are enthusiastic,” Bob Hayman, MVRHS assistant coach, said this week. The Vineyarders are led by seniors Abby Marchand, Addy Hayman, Alexis Condon, Sophie Combra, Alysse Guyther, Lollie Bezahler, Sally Caron, and Louise McDonald, and five well-experienced juniors, Katherine O’Brien, Chloe Hoyt, Megan Zeilinger, Sklya Harthcock, and Veronica Wendt. “We have a strong group of sophomores and freshmen who will begin at the junior varsity level and see how they develop,” Hayman said. He noted that 28 girls signed up for the program this year, indicating a high level of enthusiasm, and noted that young players will have the opportunity to develop their skills without pressure to rush them to the varsity level. This is a special group. For example, while MVRHS does not have an archive of past Vineyarder lacrosse scorers, The Times has kept track of Addy Hayman’s career. She sits at 225 career goals over her first three seasons, and if she stays healthy, is likely to surpass the 250 career goal mark this year. We don’t know whether that is the school record, but her skills were enough for Middlebury (Vt.) College to sign her up for the 2020 season. Abby Marchand has been recruited by Connecticut College for field hockey next year. The two women are part of the growing number of Island athletes now being recruited by D1 to D3 colleges in various athletic disciplines. It would appear that changing leagues to play schools with lower enrollments will benefit the Vineyarders. Hayman isn’t counting his chickens. “We open up on Thursday at 3 pm at home against Sturgis East (Hyannis). The new league should provide more balance for us, but we don’t have much detail on the teams in the league yet. I know that Falmouth Academy has about 260 total students. But we also play Falmouth High School, which has a large enrollment,” he said. The Falmouth High School website reports high school enrollment exceeding 800, as does Sturgis East, nationally ranked for its academics. MVRHS has about 650 students. “It’s fascinating every year as the season begins and you find out what you have. Coaches are always saying, ‘Did you see what that girl just did?’” he said with a chuckle. If past is prologue to the future, it’ll be fun to watch the Vineyarder girls lacrosse team this season.